Energise your skin and senses with the Murdock London Trios Nickelby Gift Set. 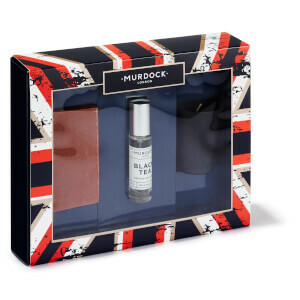 The three-piece kit contains a soap, cologne and candle all infused with the refreshing and energising Black Tea scent. Invigorate your skin and senses with a handmade bar that delivers a gentle yet detoxifying cleanse from top to toe. Powered by a stimulating blend of Madder Root and Cayenne Pepper, the aromatic soap effectively eliminates daily impurities, without over-drying or uncomfortable tightness. 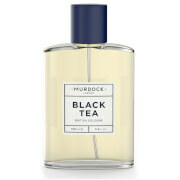 Skin feels soft and fresh with the brand's signature Black Tea fragrance to revitalise the mind and body. Crafted from the finest quality black soy wax with a distilled cotton wick for a longer, cleaner burn, the double-wick candle releases a captivating scent of subtle Spices, striking Leather and rich Tobacco. Housed in a black vessel, the statement candle will sit perfectly on a gentleman's coffee table or mantelpiece. 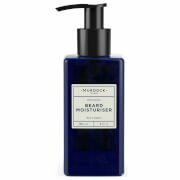 Soap: Apply in the shower, lathering directly against skin. Soap: Oleo Europaea (Olive Oil), Aqua, Oleo Cocos Nucifera(Coconut Oil), Oleo Elaeis Guineensis (Organic Sustainable Palm Oil), Sodium Hydroxide, Oleo Ricinis Communis (Castor Seed Oil), Prunus Amygdalus Dulcis (Sweet Almond Oil), Caprae Lac (Goats Milk), Theobroma Cacao (Cacao) Seed Butter, Capsicum Frutescens (Cayenne) Fruit Powder, Rubia Tinctorum (Madder) Root, Butylphenyl Methylpropional, Citral, Citronellol, Coumarin, Eugenol, Farnesol, Geraniol, Isoeugenol, Limonen, Linalool.